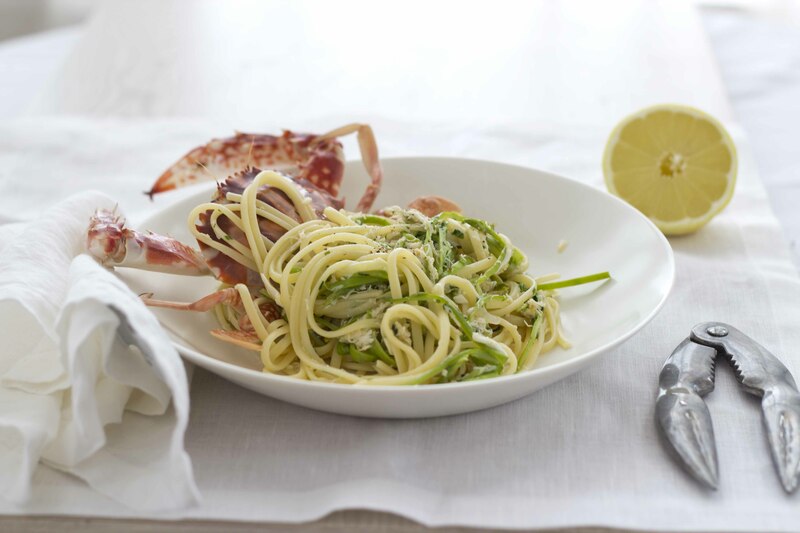 This recipe for crab linguine has a very clean flavour of crab with a depth of flavour created by condensing the crab steaming liquid and adding it back to the dish. This dish is sure to impress. 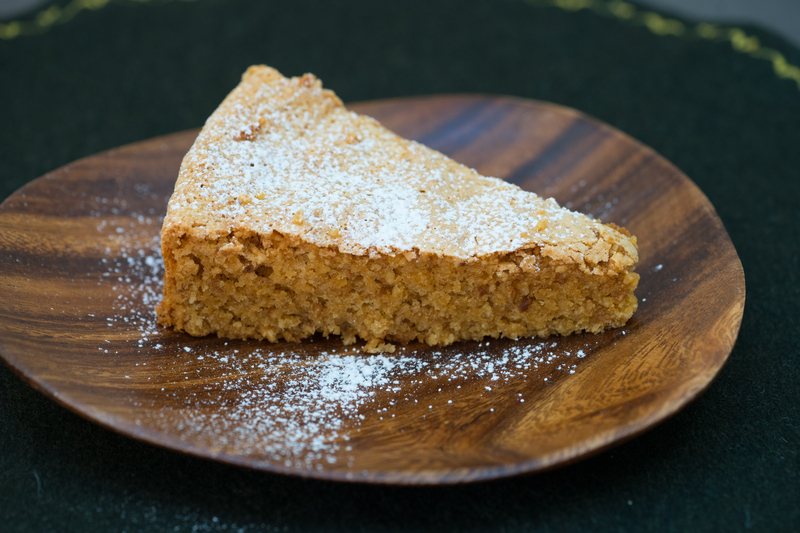 You can prepare step 2 in advance and then prepare this dish very quickly before serving. 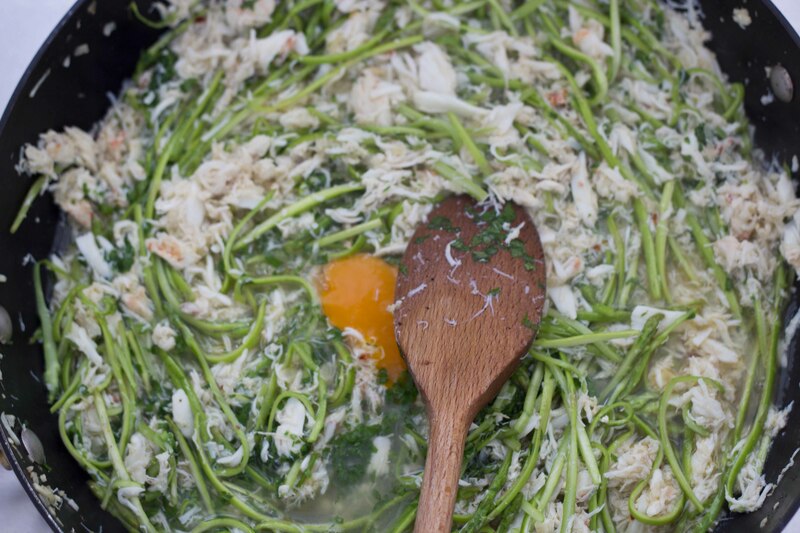 Otherwise, there is a quick version of this recipe using bought crab meat. Bring to a boil 7 litres of water with 3 tablespoons of salt added to cook the pasta in. Do not add oil to the water. 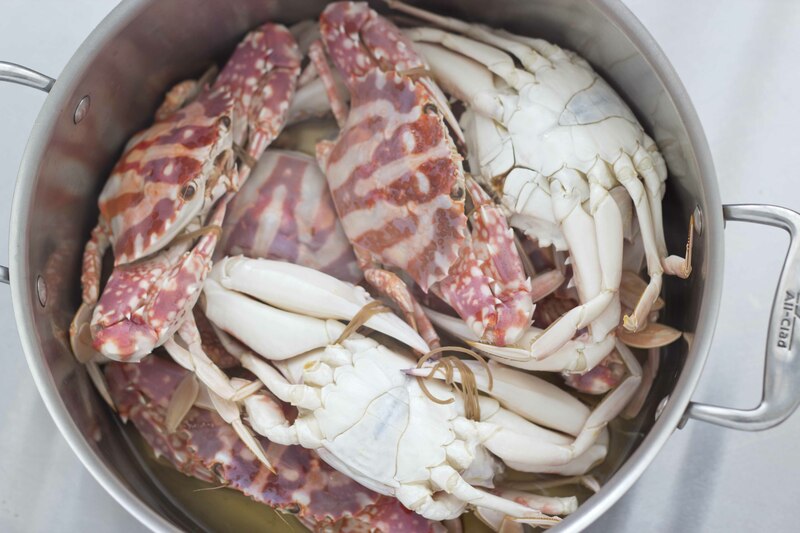 To prepare the crab: Pour the wine into a deep pot and add the crabs. Turn the heat on to medium and bring the wine to a simmer. Put the lid on and once the wine starts to steam (5 to 7 minutes), allow the crabs to steam for 10 to 13 minutes depending on the size of the crab. The crab will have changed colour when they are cooked. 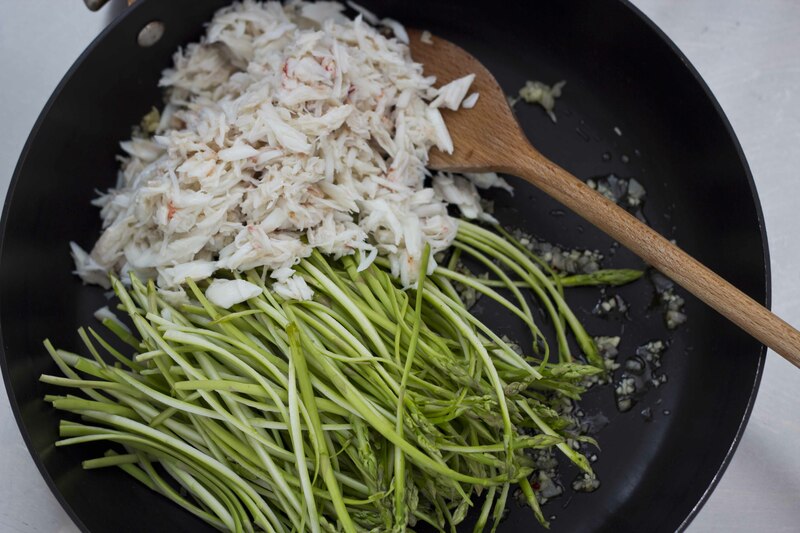 Using tongs or a slotted spoon, remove the crabs to a cutting board and allow to cool down. 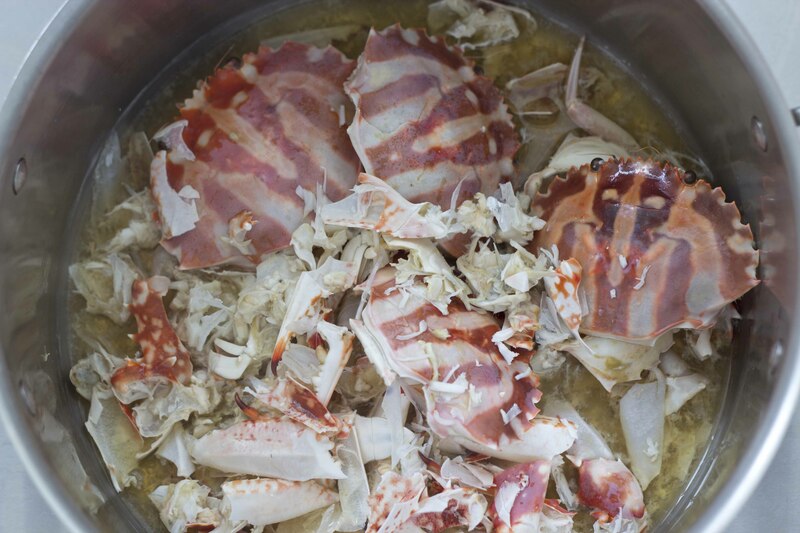 For an illustrated step-by-step guide on cleaning crab click this link. When cool, pull off the claws and the legs, twisting at the joint. 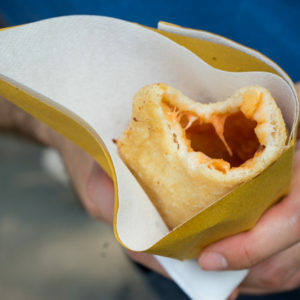 Crack them with a mallet, lobster crackers, or with the back of a heavy knife and pick all the meat out with a spoon handle. Pull the shell away from the body using a spoon. Throw away any plastic membranes, the guts (not the orange crab roe though), and the grey spongy bits (dead man’s fingers or the crab’s gills) which taste terrible. Pick out all the meat from the body. Reserve all the shells and put them back into the wine and bring to a boil, reducing until you have 375 ml of liquid left (10 to 15 minutes). Place a fine mesh strainer over a bowl and pour the crabs into the strainer to strain the liquid. Add the linguine to the salted water and cook for 2 minutes less than according to the timing on the package. Drain the pasta and do not rinse, add immediately to the sauce below. 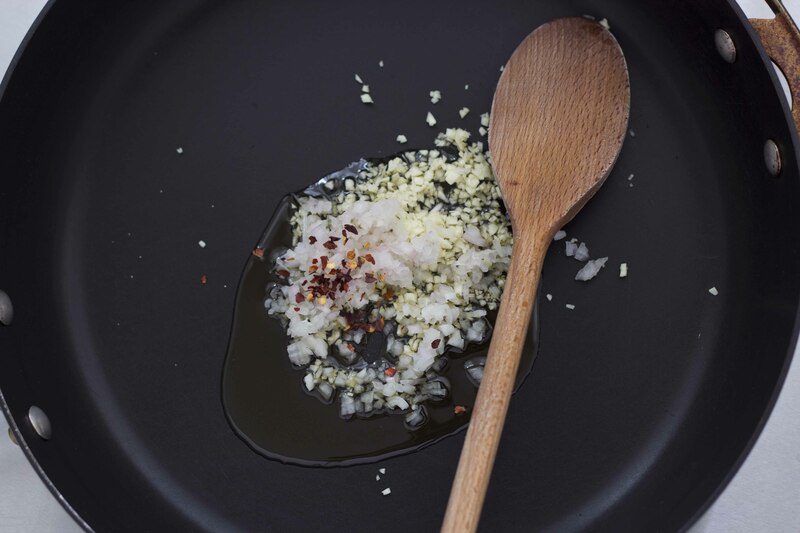 Heat a saucepan over medium heat until hot, add the olive oil, garlic, shallot, and dried chilli. Cook until fragrant, about 2 minutes, but before the garlic turns golden. 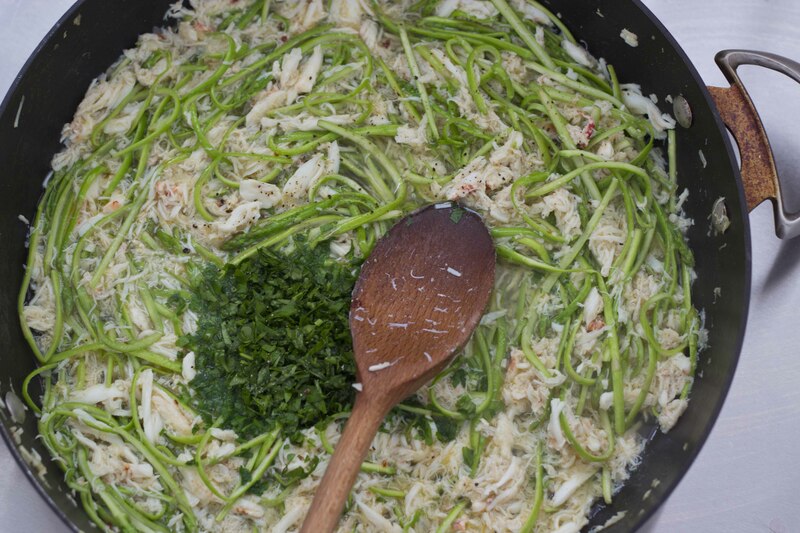 Add the the crab meat and the shaved asparagus to the pan. Add the crab cooking liquid. Cook for 5 minutes until the asparagus has softened. Add the lemon juice, salt and pepper to taste. Turn off the heat and then add the pasta, parsley and two egg yolks, stirring through, turn the heat on low and bring the sauce to a simmer for 1 minute until the sauce has thickened. Add the linguine and toss to combine. 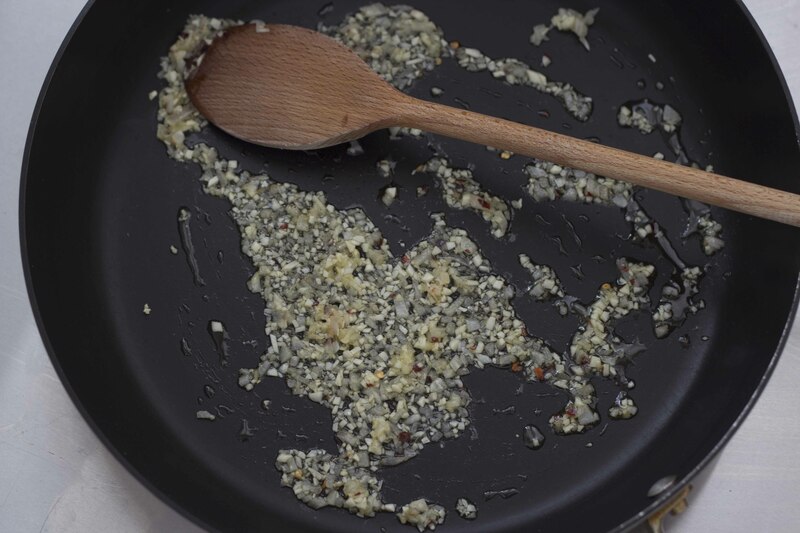 Serve with freshly cracked black pepper over the top. Please note that the preparation time will vary according to the size of the crabs. 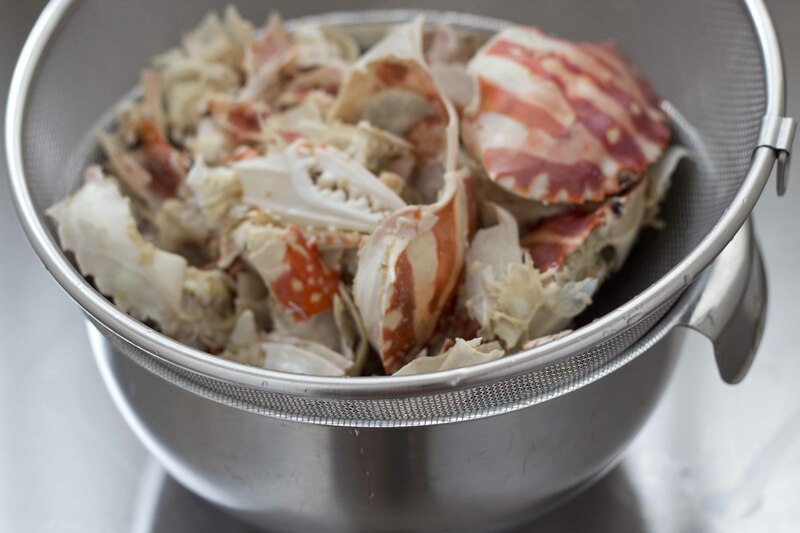 If one large crab is used the time to clean it will be shorter and if several small crabs are used then the time to clean them will be longer. 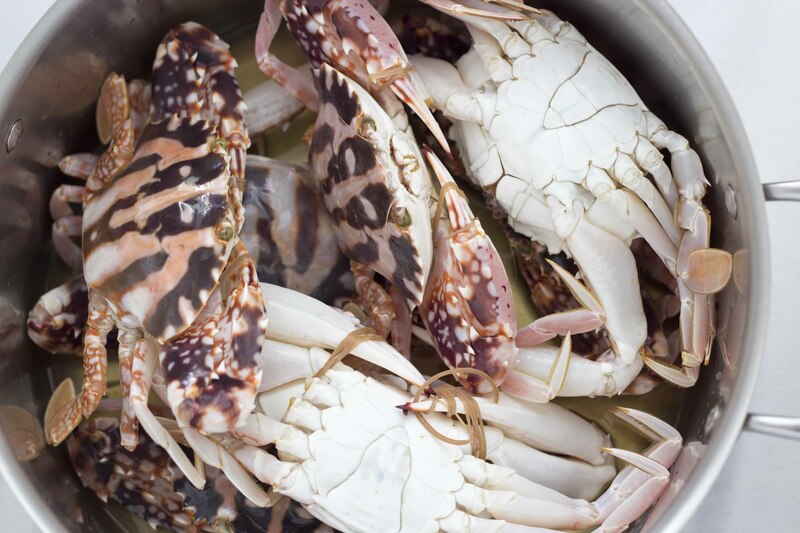 Buy 300 gms pre-picked white crab meat (instead of whole crabs) and 250 mls fish stock. Skip steps 2-7. 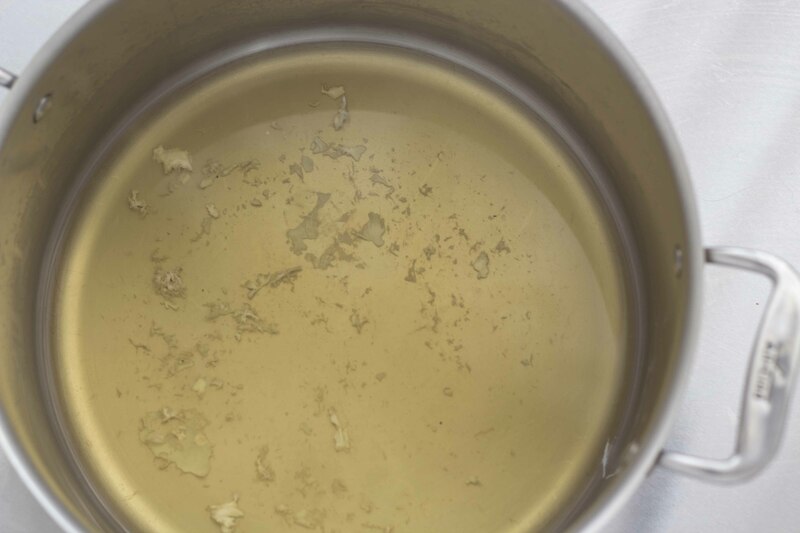 Place 250 mls fish stock and 250 mls white wine in a saucepan and bring to a boil. Cook for 15 minutes until reduced by half to 250 mls. Follow the rest of the recipe adding the bought crab in place of the picked crab and the reduced fish stock with wine for the crab cooking liquid. 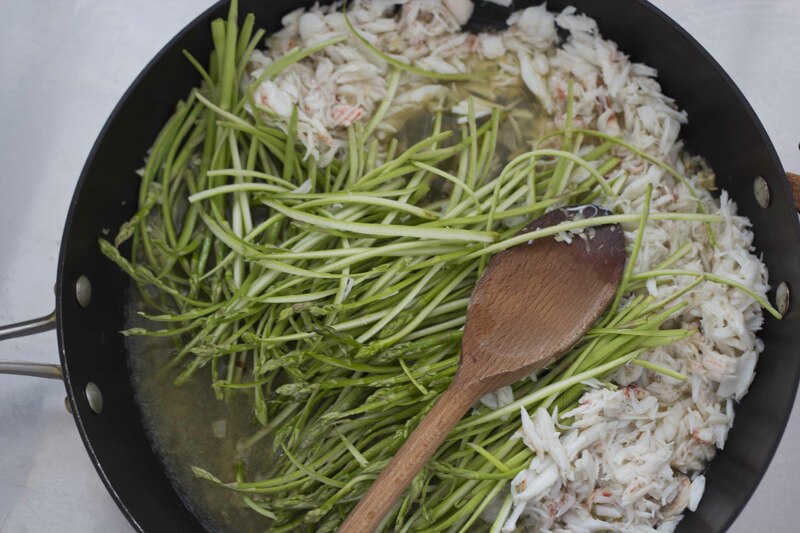 Add another 45 mls (3 tablespoons) of olive oil in step 15 as store bought crab is often drier. 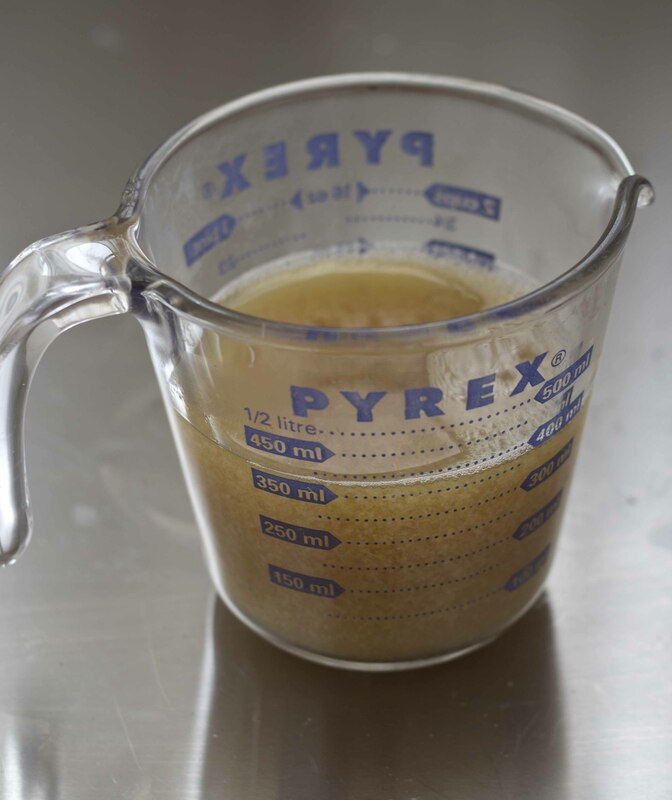 If you don't have fish stock, you can reduce 500 mls (2 cups) of white wine with 45 mls (3 tablespoons) of fish sauce. Any good ideas on how to prepare the crab roe? On the east coast of the US we have access to the Blue Claw Crabs and my Sicilian grandparents would clean them (alive) and drop them in a slow cooked marinara sauce to cook. It made the sauce incredibly sweet and after finishing your pasta (#8 spaghetti) we would spend the next two hours or so picking the crabmeat. The crabs went in the pot whole and we would use our teeth to expertly crack the two claws, eat the smaller claw sections almost like eating artichoke leaves, chewing both sides lightly and working out the crab meat from between the joints …and then get started on the body which had several nice size segments ..this was generally around August – September when crabs were in season and getting large ..4 – 5 inches across point to point. 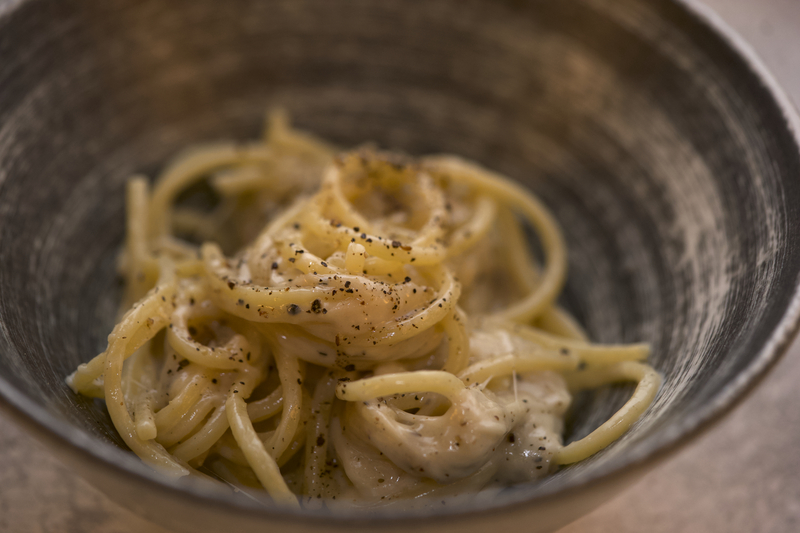 So back to my question ..they always discarded the Roe but having had a sea urchin ragu in Florence I imagine the roe could be transformed into some magical pasta sauce. That sounds utterly delicious! Yes, absolutely the female crabs are highly prized in Italian cooking. The roe can add a completely different dimension of flavour to a dish ande are often included with the meat. 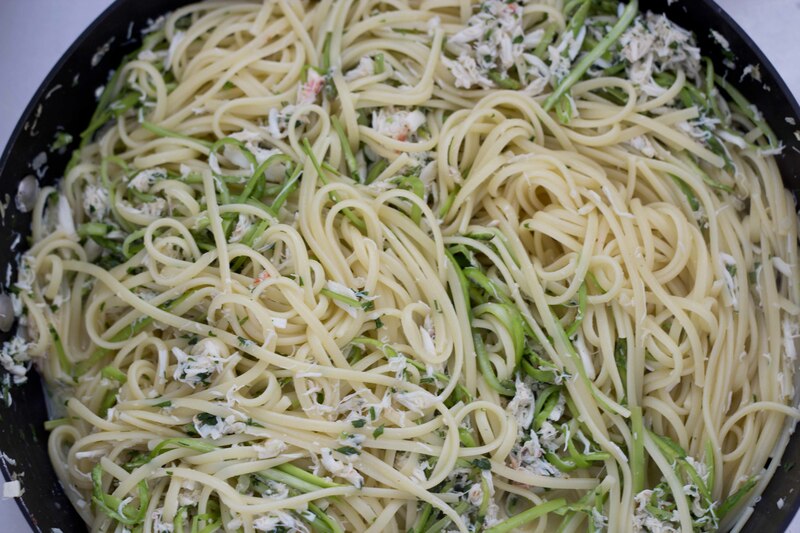 For the crab pasta, some people remove the brown meat and the roe and puree them together with the pasta cooking water and then add them to the pan at the same time as the crab meat. 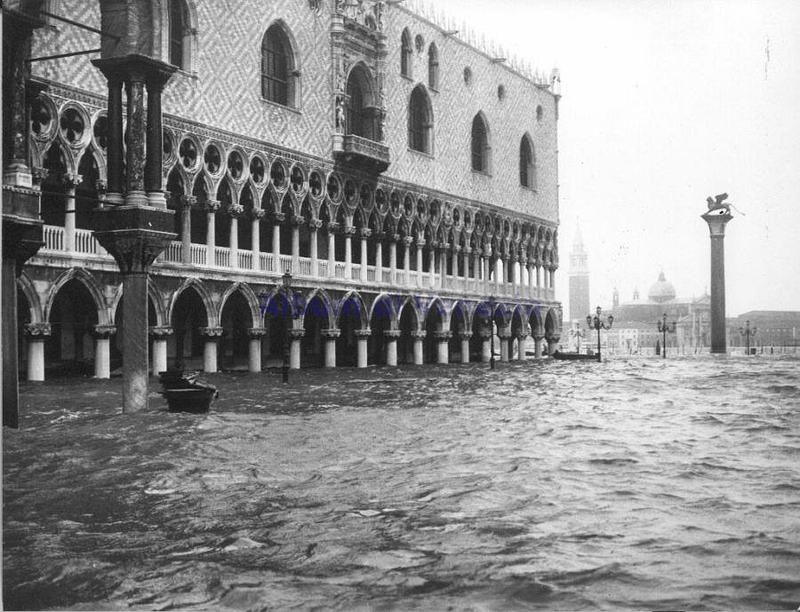 In Venice, spider crabs are boiled and the meat and roe are removed, tossed with olive oil and lemon and served together. 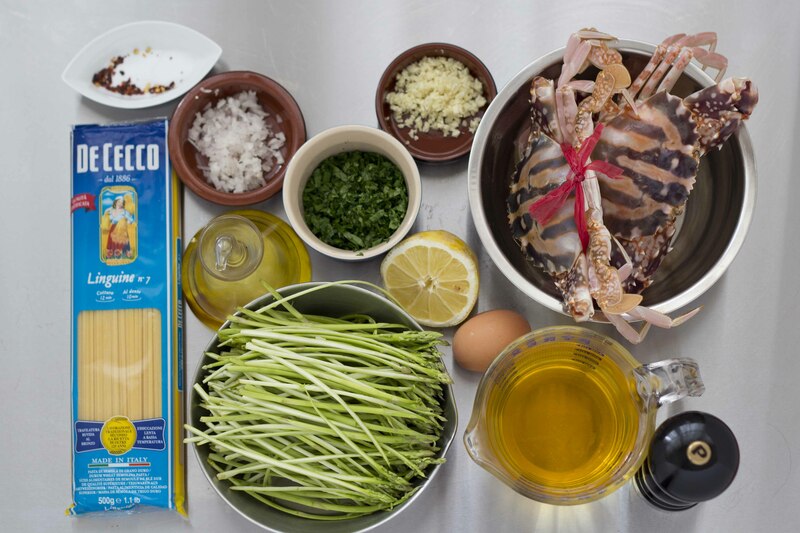 This same preparation is done for normal crabs in Sicily and elsewhere. For crab risotto, the roe is pounded with the meat and added to the risotto. I make crab risotto by frying onion and garlic in olive oil, then toasting the rice. I add some white wine and cook it until it evaporates. Then I add fish stock and 1/2 cup of tomato (either fresh which are skinned and seeded or passata). I cook the risotto and add the crab and some finely chopped parsley during the last 10 minutes of cooking. My children love this dish.